You probably think that you can cycle just with any type of shoes. Well, technically, yes, you can. However, the best shoes will enhance your ride to a whole other level. 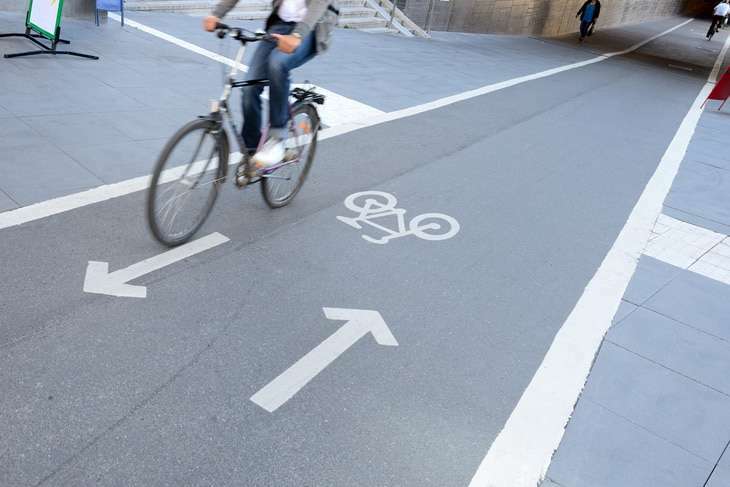 If you ride your bike to commute to work or school and back, you face different challenges on the road. But with the right pair of shoes, you can get the support, comfort, warmth, and efficiency that you need. Keep reading to find out how to choose the best commuter bike shoes and other important stuff you need to know! Before we get to the top 10 commuter bike shoes, let us first discuss some important factors to consider when choosing a pair. There are many styles, models, types, and designs out there it can easily be overwhelming. So, let me help you by walking through all the details you need to know! First, let’s talk about the different types of bike shoes. Generally, there are three that you will often see: road bike shoes, mountain bike (MTB) shoes, and city bike shoes. Most, if not all road bike shoes have smooth and stiff outsoles, breathable uppers, and lightweight construction. In fact, their exceptionally stiff soles that enable power transfer from your feet to the pedals are often used as a way to distinguish them from other types. These are constructed to be used with larger platform road pedals. However, road bike shoes are not intended for walking for extended periods since the soles are not flexible and lack traction. If you are looking for higher-end models, materials like carbon fiber are known to increase sole rigidity and decrease weight. Fit systems also give you a greater range for customization. Usually, you will find small rubber pads on the heels which provide the only point of traction. One famous and notable niche under road bike shoes is triathlon-specific shoes or tri shoes. These are built for racing since they provide maximum energy transfer. They are also easy to wear and remove so you can quickly transition on and off your ride. Road shoes can come with a variety of closure systems like lace-up to velcro or BOA systems that allow you to adjust the fit even while riding. The boa system utilizes a dial to even out the pressure across the forefoot. Laces are great for aerodynamic and allow you to customize the tightness across the foot. Most clipless road bike shoes utilize a 2-hole or 3-hole cleat system, and you have to match them with a compatible pedal. They are also not meant to be used with non-clipless pedals. To check the compatibility, look at the specs of the shoes or consult a sales specialist to ensure you can mount to the pedal system of your bike. Like the road bike shoes, MTB shoes have fairly stiff soles for efficient power transfer and pedaling. However, MTB shoes allow for just enough flexing and feature rubber-lugged outsoles that provide excellent traction for walking on rugged trails and other challenging surfaces. They have more grippy rubber soles than regular shoes or even road bike shoes. MTB shoes also perform well in a variety of off-road activities. There are cross-country racing shoes that are lightweight but high-performance or enduro shoes that can be used with cleats and clipless pedals or flat pedals. The cleats are usually recessed into the soles which allow for easier and more comfortable walking. MTB shoes are a popular choice for indoor cycling classes, touring, and road biking as well. The higher the price, you get to enjoy features like a lighter weight, enhanced ankle and foot protection, waterproof liners, stiffer soles, and a better fit and foot security. You can also find MTB shoes with removable spikes for loose or soft ground situations. They often come with a lacing system, camp straps with buckles, or a rip-and-stick system for fit adjustment. Clipless MTB shoes use the 2-hole cleat system. Some MTB shoes may also have flat soles with no cleats or any way of accommodating cleats. These are the ones specifically designed for platform pedals and optionally, toe clips. As with road bike shoes, make sure you choose something that will be compatible with your bike’s pedals. If your activities consist mainly of indoor cycling, recreational cycling, and urban cycling, city bike shoes are your best bet. Mainly, these are a hybrid between casual and cycling footwear. City bike shoes also offer compatibility with some clipless pedal systems although they come with recessed cleats and rubber outsoles for easy walking. ​City bike shoes can be further categorized into commuter shoes and flat pedal shoes. Commuter shoes are best for people who spend more time walking or standing rather than biking. These shoes are more flexible for easier and more comfortable walking. They come with treaded soles for traction as well. Flat pedal shoes look a lot like skate style trainers although they have stiffer soles for better pedaling efficiency. They usually contain more internal padding for comfort. However, this also means that they absorb more water and take a lot longer to dry up. Flat shoes may use ultra-traction rubber soles inspired by climbing shoes or some lace cover to decrease water absorption. Another thing to consider is the pedal compatibility of bike shoes. Most of them are designed to be compatible with clipless pedals and come with holes in the soles where the cleats are attached. Cleats are features that snap into the pedals for a more secure, non-slip connection. These cleats are often sold separately from the shoes but may come with the pedals themselves. As you may have already noticed, some bike shoes are compatible with both 3-hole and 2-hole cleat designs which makes them great especially if you tend to switch between bikes with different pedal systems. However, most shoes will accept either one of the other. Shoes that are made for the 2-hole system cannot be modified for a 3-hole system. A 4-hole Speedplay pedal system, on the other hand, can be adapted to fit many shoe styles. The two-hole system is also known as the SPD system or the Shimano Pedaling Dynamics, which is the first such system to be introduced. This system is used for all types of riding including mountain biking, commuting, touring, and road cycling. In shoes, the recessed cleat design allows the user to walk more easily and with less noise than any other system. The 3-hole system is also called the Look-style system, which is again the pioneer of this system. It is most often used for road cycling since it provides the most efficient energy transfer and stability. This is because the size of the cleat is larger, allowing the force to be dissipated and spread over a larger area. This helps maintain a secure connection when you are pedaling hard and also reduces the pressure put on the connection points. Next, you should also consider the bike shoe closure system or style. Cycling shoes may feature any or a combination of several types of closure. Lace-up closure systems are probably the most common. They also offer the most comfortable and customizable fit. However, they can allow water to seep in and get your feet wet and dirty during inclement weather conditions. When using shoes with laces, make sure that the ends are either short enough or tucked away securely to prevent them from getting caught in the chain especially if there is no chain guard. Rip-and-stick straps like Velcro are convenient and quick, which is why these are often used for children’s shoes. They remain grippy and usable even in wet and muddy conditions. Also, these straps stretch less than laces and so are less likely to come off or undone. While most shoes feature 2 to 3 straps, more straps mean you can adjust to get a better, more customized fit. If your priority is the security of your feet and clamping power, opt for notched cam straps with buckles. These come with a higher price tag but is the most reliable closure system. 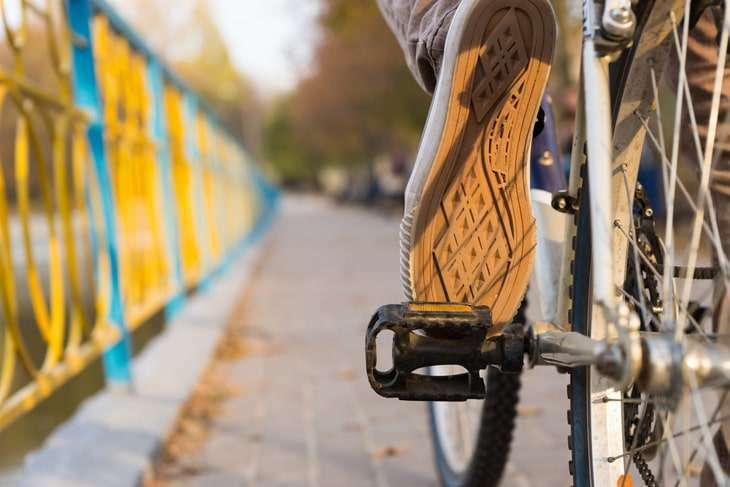 Just like in any other type of shoes or footwear, you need to make sure your bike shoes will fit securely and comfortable right from the start. Because bike shoes have stiff soles, they may take a while to break in and have less chance to conform to your feet later. The right size of shoes will typically have enough room for your toes to slightly wiggle around. The arch should be well-supported and snug while your heels should not slip or slide up and down. However, when trying on bike shoes, you may notice that your heels will slip a little as you walk. This is again, due to the stiff soles which are designed to stabilize and support the feet while cycling. If you feel like the slippage is caused by a poor fit, try on a smaller size or opt for a different shoe model. 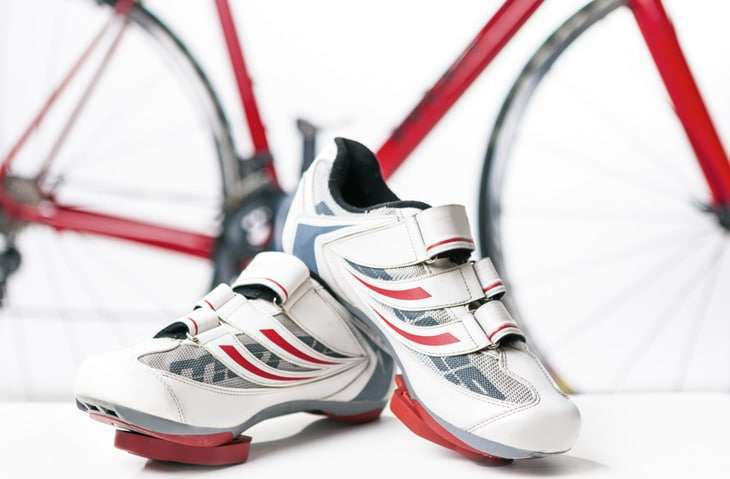 Bike shoes may also come in various sizing systems, usually European or U.S. However, the sizing usually depend on the manufacturer. So, make sure to get your exact measurements and compare these with the size charts of a specific brand or shoe model. Bike shoes should be cleaned every after use by simply wiping them off with a rag or towel. If there is any stubborn dirt like mud or stains, you can use a soft brush with a little dab of soap and some warm water to remove them. Then, finish off by wiping with a clean cloth before drying. Leaving or storing your bike shoes while they are wet is always a recipe for disaster. This will not only risk them getting permanent marks and stains but can also damage the material. So, make sure to thoroughly dry your wet bike shoes first with a towel and then a boot or shoe dryer. A boot or shoe dryer uses a gentle flow of warm air that will slowly but completely dry your shoes within a couple of hours. One technique that you can do is to pack the shoes with crumpled newspaper and leave them like that overnight. The next day, the newspaper will have absorbed the excess moisture from your shoes. Depending on how wet your shoes are or how quick your shoes to dry, you can also replace the newspaper every few hours or so. Once the cleats are worn to the point that they disengage from the pedals, you need to replace them. Any cracks or breaks are also grounds for a replacement since damaged cleats may unexpectedly fail or not function properly. For avid riders, cleat changing may need to be done as often as once a year. For casual riders, cleats may last for up to five years before needing to be replaced. Bike shoe covers are booties often made with a rubberized laminate or neoprene that offers water protection and insulation. You can slip these over your cycling shoes whenever the weather is wet or cold. Bike shoe covers often have holes or cutaways where the lugged soles or cleats can pass through. Note, however, that shoe covers are solely meant for riding so always remember to take them off when walking. Aside from shoe covers, there are also toe covers for slightly chilly rides. These are less bulky and more convenient but can only provide some level of warmth. If you are looking for a versatile pair of shoes that combines performance and comfort, the Giro Rumble Vr could be the one for you. It features clipless pedal compatibility for function and a Vibram eco-step rubber outsole for excellent traction both on the pedals and most surfaces. It is also lightweight at only 425 grams for a size 42 and comfortable to wear thanks to the supple synthetic fabric and mesh upper. The inner shank is injected to allow a more efficient energy transfer from your feet to the pedals. These shoes also offer amazing flexibility whether on your ride or while you are walking on a trail. Other features include a molded SPD-compatible shank featuring an optimized cleat zone, a high-quality lace-up closure, and a comfortable EVA midsole. This model also comes in 4 stylish color schemes. If you are looking for unique cycling shoes that are a cut above the rest, look no further! The Rockport Men’s Leader 2 Bike Slip ons give a classic formal spin on sportswear. These square toe shoes are made from a range of smooth leathers that will surely add a professional flair to any outfit. For a polished look, these come in slip-on styles, or you can also get a lace-up version. Featuring lightweight shock-absorptive midsoles and an EVA outsole, Leader 2 helps prevent and reduce foot fatigue. The footbed is also cushioned and reinforced for durability. You can get a pair of the Rockport Leader 2 in black, truffle tan, or tan. The Five Ten Freerider MTB Shoes for Men are popular for multiple reasons. These shoes are made with 100% leather and synthetic materials for the ultimate performance and technical advantage. They offer unparalleled comfort and grip. The unique Five Ten Stealth S1 rubber outsole with dotty treads keep your feet fixed on the pedals as well. A mesh and suede upper helps keep your feet cool and comfy all day long. The Freerider’s design also allows you to wear them confidently both on the bike and on your feet. The lace-up vamp also lets you get a secure and snug fit. You can get these shoes in eight different stylish color schemes! 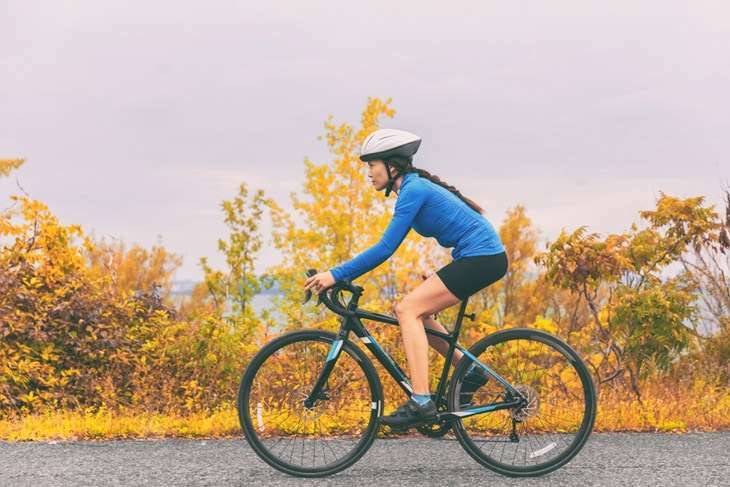 Boasting of superior compatibility and versatility, these Road Bike Shoes for Women may just be the ones you are looking for. They offer the best blend of performance and comfort perfect for commuting, road biking, spin class, and touring around. The cleat area is also compatible with 3-bolt, and 2-bolt cleat sets to provide you with an excellent grip and perfect platform for whatever type of pedal you ride. Sizes are indicated in the size chart to help you ensure the right fit. Low profile hook and lock Velcro straps also allow you to adjust accordingly for an ergonomic and precise fit. This also adds security and comfort to your ride. Fiberglass reinforced soles provide maximum power transfer and optimum stiffness. This allows you to ride faster and longer since you use less energy. For your comfort, the synthetic leather upper hugs the foot snugly while mesh portions provide breathability and ventilation. You can get your Tommaso Pista Road Bike Shoes in black and blue, black and pink, or white and silver. The Giro Men’s Treble II Bike Shoes offer efficiency and comfort at a budget-friendly price. Featuring a high-quality synthetic fiber, these shoes are breathable, flexible, and durable. Thanks to the universal cleat mount system, these shoes can accommodate both three-bolt and two-bolt cleat patterns for the ultimate compatibility. The molded EVA footbed not only offers cushion but also medium arch support. It also has an Aegis antimicrobial treatment to fight bacteria and bad odor. The stiff injected nylon outsole provides support while encouraging an efficient power transfer to fight fatigue. Other features include hook-and-loop straps on the forefoot for a quick custom fit adjustment. You can get these shoes in white, matte black, or black and yellow. You may have heard of the Fizik R1 Uomo shoes but soon realized it is a bit too pricey for someone like you who could use the performance and comfort it offers but would prefer a cheaper option. Well, you’re in luck because Fizik recently introduced the R5 Uomo Boa Road Cycling shoes for Men! Because they are not made with the same kangaroo leather as the R1, these shoes are much more affordable. Made with a highly breathable and durable Microtex fabric featuring mesh windows for ventilation, these shoes offer the same comfort for your feet. The Fizik Superlight insoles even absorb vibrations and support the arches. The carbon-reinforced nylon outsole also provides efficient power transfer without the same carbon cost. The low stack height and engineered outsole maintain flexibility during long rides while molded heel cups minimize slippage and help you keep the ideal pedaling position. The R5 Uomo also uses the Boa closure system featuring a continuous loop and single dial for micro-adjustments in combination to the hook-and-loop closure to achieve a perfect fit. When purchasing a pair, you can choose between five color combinations of black, white, and gray. The Louis Garneau Women’s Multi-Air Flex Cycling Shoes are your ideal companion for the daily commute, training, spin class, and weekend rides. These shoes are flexible, breathable, and versatile. Because of the roomier standard fit and adjustable hook and loop fasteners, you always get a custom fit for the most comfortable all-day riding. Say goodbye to overheating and sweaty feet after cycling thanks to the breathable mesh upper and synthetic leather material as well as the ventilated EVA insole that allows sufficient airflow within the shoes. The fiberglass and nylon composite Multi Air Flex outsole not only supports the heel to relieve pressure as you walk but also allows good toe flexion. These shoes are also compatible with SPD cleats for all major MTB pedals. Get yours now and choose among 5 different amazing colors namely Asphalt gray, magenta, black and pink, mat black and navy, and black. Next, we have the Shimano SH-RP2W Road Cycling Shoes made with mesh fabric and faux leather. These shoes are great for entry-level cyclists, club cycling, and indoor cycling. With tough, stretch-resistant upper materials, you get comfort and durability. Triple adjustable hook-and-loop straps also let you customize the fit while an offset strap helps with relief on pressure points. For the ultimate comfort, the Shimano RP2W also has a breathable fabric lining, lightly padded collar, and removable foam insoles. The fiberglass reinforced nylon outsole have polyurethane lugs for traction and shedding mud. It is also compatible with two-hole and three-hole SPD cleat designs. Another great pair of shoes from Giro are the Carbide MTB Bike Shoes for men. Like any other premium Giro shoes, The Carbide MTB is tough and durable yet supple and comfortable. It also features the classic Giro form and a supportive fit. The synthetic leather upper has three wide straps so you can make quick, easy, and precise adjustments to achieve the perfect fit. The EVA footbed not only offers supreme arch support but also features the Aegis antimicrobial treatment that fights terrible odor. It also helps enhance comfort and fit. ​The nylon soles are also stout-injected to improve power transfer onto the pedals. High traction lugs and a midfoot scuff guard also function for traction and to accommodate steel toe spikes. Available colors include black/charcoal, dark shadow/flame orange, and lime/black. Last but not least, we have the Shimano Men’s CT500 Casual Cycling Shoes. These comfortable, sleek, and functional shoes allow you to stay active while also keeping it casual style-wise. The upper is made with leather and textile for a classy, polished look. The lace-up closure offers a more snug fit while the pull tab at the rear makes putting them on so easy. A concealed inner shank plate improves power transfer to the pedals so you can ride longer. Thanks to the EVA midsole, you also get additional response and protection from impacts and shocks. The cleat installation is so easy because it is optimized for SPD and the Shimano Click’r pedal systems. You can get this model in three different colors namely black, navy, and olive. The best commuter bike shoes are clearly the SHIMANO SH-RP2W Road Shoe for women and the Five Ten Freerider MTB Bike Shoes for men. Both offer comfort, versatility, good performance, and value that is why many users love them. They also come with adjustable straps or laces to ensure a proper fit. There you have it! I hope you learned a thing or two from this article. If you have any questions, reactions, or suggestions, feel free to leave them in the comment box below! Maxi Climber Vs Versaclimber: Know The Best For Your Needs! The Best Tennis Strings Of 2018 Revealed! Find The Best Running Shoes For Metatarsalgia Here! What Is The Best Crossfit Gym Bag For You? Discover It Here! 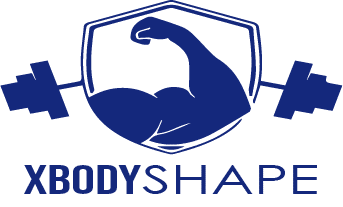 Best Posture Corrector Rounded Shoulders In The Spotlight! Discover The Best Table Tennis Table For The First Time Here!